NEW DELHI, September 6. /TASS corr. Evgeny Pakhomov/. If the US decides to implement sanctions against India due to their purchase of Russian S-400 missile systems, then all three countries will lose, Indian political expert and distinguished fellow at the Observer Research Foundation Nandan Unnikrishnan told TASS on Thursday. "If the United States implement sanctions (against India due to S-400 deal with Russia - TASS), all three countries will be losers," the expert said, commenting upon the results of the first India-US 2+2 summit, which took place in New Delhi. 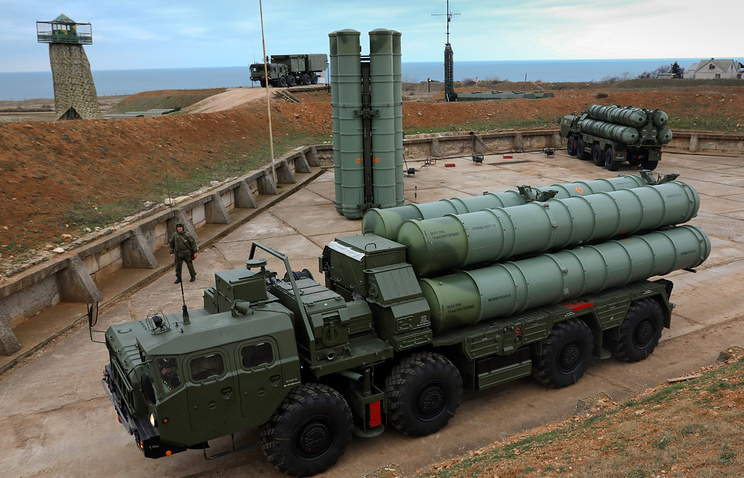 "I’m sure they [India and the US] discussed it (the S-400 missile complexes - TASS). I’m sure India reiterated its current position that we do not see any reason to give up the deal. And we would not like the United States to see that as a threat to the United States, and therefore, should not impose any sanctions. I don’t think India at this stage is ready to walk away from the S-400 deal," the expert stressed. According to him, the Indian side is satisfied with the India-US dialogue because they have been able to "breach all the differences and bring an agreement that is acceptable to both sides." "The Indian side should be satisfied, because they have managed to get commitments from the United States, for example, the signing of communications agreement (Communications Compatibility and Security Agreement, COMCASA - TASS). And yet, they have managed to keep the differences on trade separate for the discussions, I presume," he said. "At this point of time, more importantly, both sides have succeeded in not exposing the differences amongst them and they’ve been able to concentrate on what is common and what is leading to agreement," the expert added. India’s ties with Iran may also serve as a cause for US sanctions. In reply to the question about whether India and the US may have discussed Iranian oil at the summit, the expert stated: "I think they would have discussed it. I think there would have been a partial compromise in the sense [that] India would have said that they can reduce the amount of crude they’re buying, but would not give it up totally. And the reason is the decision of the government of India to allow government companies to use Iranian ships and Iranian discounts on insurance to continue importing crude from Iran. It’s an indication in that direction." "I think equally important is India’s desire to use Iran as a connectivity hub. As connectivity to Afghanistan, as well as to Central Asia, as well to the North-South corridor, to Russia and Europe. Now those are also of strategic importance to India, and I hope these issues were also discussed," Unnikrishnan said. In 2015, Iran and six major powers (five member states of the United Nations Security Council - Russia, the United States, France, the United Kingdom and China - and Germany) agreed on the final Joint Comprehensive Plan of Action (JCPOA). It provides for the lifting of sanctions imposed on Iran in connection with its nuclear program. In exchange, Tehran was obliged to place its nuclear program under international control. On May 8, 2018, US President Donald Trump announced the withdrawal of Washington from the agreement, and called on all its partners not to make deals with Iran. However, India continues to trade with Iran because it offers cheap delivery and long credit terms. US Secretary of State Mike Pompeo and Defense Secretary James Mattis held the first high-level 2+2 talks with Indian Foreign Minister Sushma Swaraj and Defense Minister Nirmala Sitharaman on Thursday in New Delhi.